Ecosågen 2012, like a rocket!! 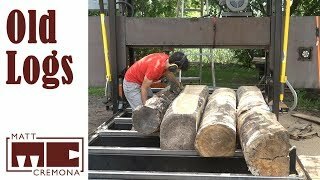 Sawing Old Logs - How long can I wait before sawing logs into lumber? 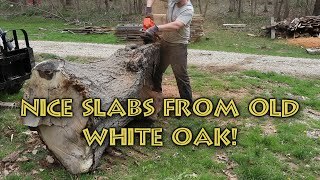 Huge White Oak Slabs! Here's how I won! Why does the blade have so few tips? You would have to ask Jake at Turbo Sawmill. All I know is that the mill blade cuts like butter. 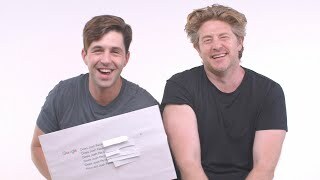 I enjoyed the video thank you for filming . The trouble with producing videos while trying to get something done, you have to do everything yourself even though you have someone else there. I was waiting for a new video for a long time :) Thanks for this one! This sawmill looks great! 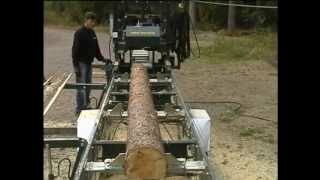 Great video and nice sawmill. Only issue I have with that type of sawmill, (manually reset the blade), if that guard ever comes loose, your leg is toast. Better design if the blade tilted away from you instead of towards you. Okay, but, get a oversized cant hook, and that log will roll right up quite easily and accurately. Wow, what a nice surprise!!! That famous original video was always one of my favorite! The equally famous beautiful narration not being the least of reasons. Glad to see that not only are you "back", but that you are more at it than ever, and you kept the great narrator! jujoynt - Wow!!! It's really YOU?!?!? I am honored! You're famous!!! Best narrator EVER! Thanks Samuel - I love filming David at work and assisting drawing out the wealth of knowledge, with my questions and comments! A real shame to see all that Redwood go like this and i'm not a " Tree hugger"
I am completely uneducated when it comes to lumbering/harvesting trees. I have one question and im sorry if it sounds stupid but i would really like to know. Isnt it illegal to harvest redwood trees anymore? I remember watching a cable TV show that showed the "loggers" harvesting deadfall and very old stumps that were cut many many years ago by the look of them because they were not allowed to harvest standing redwoods. I am just curious because i enjoy your videos and enjoy learning about this field of work. Perhaps you are familiar with what im talking about and can explain what i have mixed up? And by the way that is absolutely beautiful wood! I see. Thank you to all who explained. I love to watch these types of videos plus all the woodworking and turning videos. So much talent out there. I only wish i could have even just a small amount of it! Joseph Klein old growth redwoods, so roughly 500 to a thousand years old, are protected and can’t be harvested. “Young” growth trees are harvested to help keep those old growth trees healthy and strong, as well as to leave more nutrients in the soil for other younger trees to obtain. Thinning the forest but taking SOME young trees will allow the old growth and other young ones not harvested a chance to obtain more nutrients without competition so to speak. Thank you, and yes these had to be old growtn redwoods. The stumps that were in the tv show im talking about were unbelievably large. I mean huge like in the old time pictures they show from way back in the day,. They turned them into beautiful things. One that comes to mind was a hube table top. They had to dig the stumps out of the ground and then take them out of the woods on flatbed trucks. Im assuming those types of redwoods are no longer available for harvest? I think it would be difficult getting the necessary permits to harvest old growth redwoods...especially since most of what is left is in parks. No it isn’t illegal to harvest redwoods. especially when u are talking about a log that is wider at the bottom and u know u will have excess material on 1/3 of the log. You did a great job milling that redwood into outstanding lumber! I love the smell of freshly milled redwood. Nice work. This seems a lot harder than a bandsaw mill. The only difference is that the bandsaw mill just slabs the log, So you would have to rip the slabs at some point I guess your mill has the advantage of the dimensional lumber being light enough that one guy can lift one. With my back, I wouldn't want to try to lift one of those wet 4x8s, much less a 16/4 slab! IncognitoTorpedo I like that you mentioned the only difference is you have to rip the slabs lol. I’m just imagining all the re-handling all the slabs to convert them into boards... I don’t understand where you got to the conclusion this is harder. 2 cuts and you have a light weight finished board to remove. IncognitoTorpedo these mills are actually light years ahead of a bandsaw. One of the main advantages is that you don't move the log once it's where it needs to be. Imagine having to roll that log three or four times on your bandsaw mill. The reason it took so long is because that redwood log is so expensive. So he is trying to maximize every piece. Another advantage in a swing saw is that you get a dimensional piece of lumber for ever down and back pass. Hurrah! I keep coming back to your old series. Looking forward to a load more,please! Take a couple cut off slabs and put it under your next cut. Might save your chain a little wear when you hit the dirt. Pour a concrete slab that you can mount a removable winch to, then winch the logs up instead of pulling with the 4-wheeler. The spikes in the log ends for an axle mentioned lower in the comments would be a good idea too. Novice question from a rookie woodworker here...do you commercially recycle all that sawdust and shavings? I use the sawdust around the base of rhododendrons and garden paths. David and Julie thank you for videos great work. cant you compress all that saw dust and shavings into fire logs or pellets ? This machine is a joke! This video was about 10 minutes too short. Beautiful lumber. Great skill! Has it really been two years since your last post. The videos are great. Great content. Lol its a lot simpler measre pith to pith either side and get sawing he did a lot more than necessary also the beam is usually never level u don't want it perfectly level line the beam up with the log and skip all the overthinking. And chalk the log before everything. Yes I agree with you. A band saw mill is the way to go for me. Plop it up in the tracks, lock it down and start sawing. Brian Ballard lol (Snopes check required). Would love to have a couple of truck load of those logs. Would make a great house. 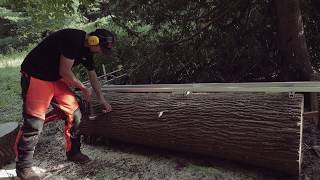 Goes to show that with some planning and forethought, one is able to maximize the yield of high quality timber from a log. I'm jealous that you have ready access to some beautiful redwood trees to mill into lumber. Dang, put the camera on a tripod n go grab the other end of those boards will ya, lol. 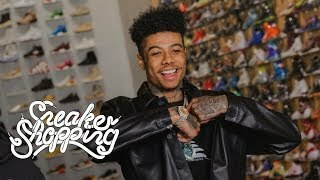 Another great video! Really nice to see new videos David!! Really enjoy watching these and your knowledge and precision is impressive!! why do you a circ saw mill instead of a bandsaw mill?, or did I miss that. Easier and more efficient way to get dimensional lumber. Bandsaw mills are good for slabbing. A bandsaw mill is a very different kind of cutting process...a swingblade fits my purposes best. great video. nice mill. loved it. Careful now , you're showing your age ! I Loved that show. I sometimes call my boss colonel clink, he has no idea why. LOL !! Drive a spike with a piece of chain and a washer into the ends . Hook a chain from each end to the 4 wheeler. There you go. I do this with hay bails. I use a riding mower. I’m sure you may have done this before. You're doing pretty good, from an Alaskan chainsaw to a saw that can chainsaw Alaska. Kudos to Julie for Videoing and drawing the information out of David with constant questions. I bet David enjoys the new Turbo Sawmill. It looks alot faster than the Alaskan. I'm happy to see you are back to making videos. This was a great demonstration and I liked all the details on the setup. Thanks For The New Video David! Blessings and Aloha to You! Julie Joynt is back again! I love her interviews and her accent. Julie you have excellent interviews and documentaries. You get the information out of your subjects by drawing it out with questions and observations. Great camera work I might add. You should have your subjects point the camera at you or put it on a tripod so we can see you as you sum up what happened in the video. Thank you John - yes, I think it came together well. My favorite part of the video is where David is rolling the 2500 pound log up the hill with the ATV. Who ever would have thought of that! I agree! Julie is great and we enjoy working together. Bring on the tripod! Thank you very much for the new video!